2 people are interested in World Peace. 4 people are going (participating). 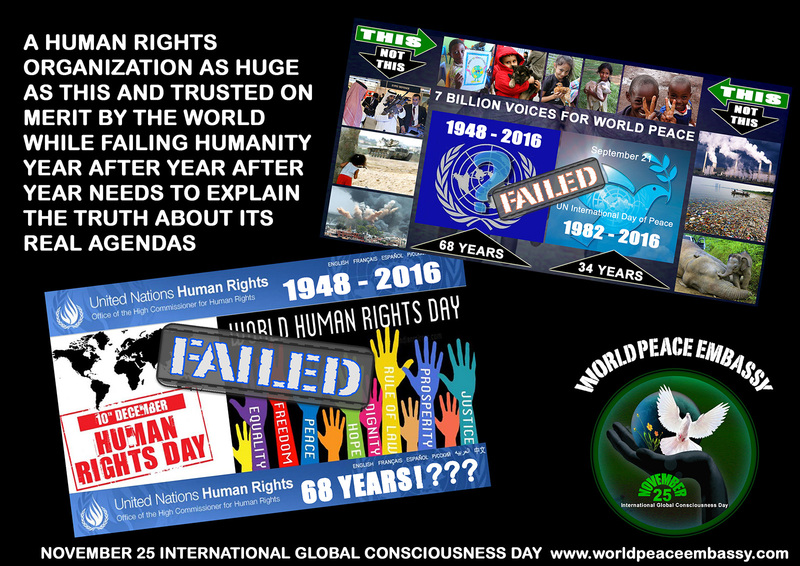 This event is the 7th November 25 International Global Consciousness Day since it was first aired on Facebook along with a Petition/Declaration sent in hard copy to the Un to endorse, followed by several petitions for the Facebook users community to participate. Participation depends entirely on the initiative of individuals to share this event for it to go viral and to make an effort to read and understand the November 25 Principle. Thousands of people are familiar with the November 25 message, acknowledged by related articles, posters and Profile Pictures post "Likes" the past 6 years, but actual positive participation has never eventuated, people aren't getting the point of a United Voice by means of a single Profile Picture flooding Facebook so that the media and the governments will take notice. 1.6 billion Facebook users - a Voice for Change that cannot be ignored. With the back up of even half that number of World Peace Profile Pictures a world peace initiative against wars and corruption was proposed to be initiated through VOICES FOR CHANGE and the WORLD PEACE EMBASSY. The initiative was based on support by and for all campaigners for Justice in all humane issues including Justice for people, animals and the environment, globally. There are many reasons why the November 25 Project has never eventuated to any effective degree, probably because it was but one individual's initiative, not an organization to begin with. Never anticipated to be an organization, VOICES FOR CHANGE was, and still is, a group of 20 everyday people from different parts of the world, none with any particular skills to push the November 25 Project to daily news headline status - all we were/are able to do is share the message across Facebook hoping it would catch on, a fete identical to walking blindfolded through a war zone. The November 25 Project remains as it has always been, unattached to any organization government, corporate, religious, charity, whatsoever. The November 25 Project is a Globally United People for Justice Project, by, and in support for, all who want a world without wars, crime and corruption. After 7 years of writing to deaf ears and making over 6000 posters on all aspects of the subject that are floating around cyberspace in obscurity, I no longer have the energies left to carry on this mission impossible. Facebook/Youtube people cry out for change, unity, justice, peace revolutions, demonstrations against the corporations and corrupted governing regimes, but are not prepared to unite their voice in solidarity for change by means of a Profile Picture? I am not repeating myself endlessly. November 25 International Global Consciousness Day is out there on the social media network for anyone to read and think about. Google/FB/etc Crime Inc. has a lot to answer for. But the public using these despicable media needs to wise up to the fact that they are being used for corporate ends and corporate ends are far removed from a world in which every living soul can live without fear of falling prey to the all too evident, rampant crime that holds us all in its vices. War, crime, corruption, destruction of our ecosystem, wildlife and humanity, the World doesn't need it, no one needs it. There are ways to change for Peace, and Justice but you have to want it, it won't come by itself. Continue to be divided by the religious/corporate/political establishment, and you'll be forever living on the losing dead end. Think... Change starts with you, it starts when you stop patronizing the organizations, institutions and industries that sell you lies as truth. World Peace will change everything, but it can't be done by a divided society.